Photographing action has long been a challenge for photographers. Quite often when we think of action photography, we think of sports. However, creative arts like dance can confront the photographer with a challenge to capture and portray physical movement. 2008 marks the 75th anniversary of one of the leading ballet companies on the U.S. and international stage--the San Francisco Ballet. 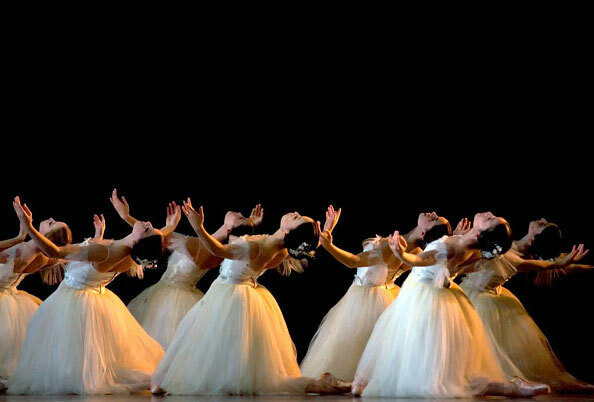 The company is recognized as the first American professional ballet company. 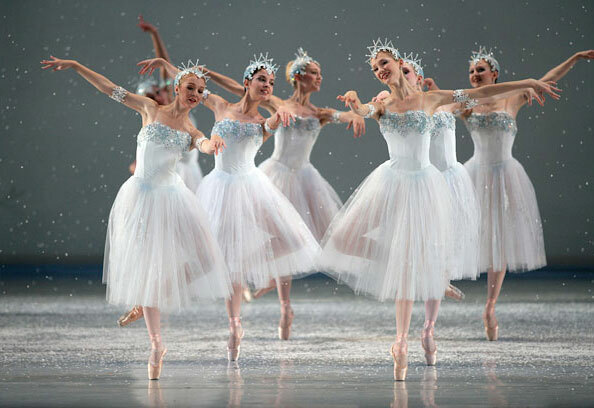 Noted for performing the U.S. premiers of many well known ballets such as Coppelia, Swan Lake and The Nutcracker, the company frequently debuts new works by many of the world's leading choreographers. Erik Tomasson is the resident photographer for the San Francisco Ballet. His photographs of dancers and the dances they perform are regularly featured in the Ballet's program magazine, as well as numerous advertisements in other publications, on city buses, and billboards. Tomasson's work has been featured in publications such as TIME Magazine, The New York Times, San Francisco Chronicle, Wall Street Journal, San Francisco Examiner, The Times (London), London Observer, New York Sun, Pointe magazine, Dance magazine, Dance Europe magazine, and Danser magazine, among others. Jerry Currier: Prior to 2004, you worked as a director of photography for commercials for many major companies such as Toyota, Kellogg's, Coca-Cola and others. What does this position involve? Erik Tomasson: I was the cinematographer. I did all the lighting and camera work for the commercials and music videos. JC: Erik, your bio states: "His work for United Way garnered a Silver Mobius Award, and he was awarded two Gold Telly Awards for his work on behalf of Instant Auto Insurance." What is the significance of these awards and how are they decided? ET: To be honest, I was unable to attend the ceremonies of the awards due to work at the time, so I'm not sure how they are decided. As far as their significance, I guess one could say that in the world of, awards usually help you get more work. JC: I understand that you graduated from the Art Center College of Design, Pasadena, California with Honors from the Film Program. This seems to imply that you were originally interested in cinematography. What caused you to change your focus to still photography of ballet and the dancers? ET: Well, I actually started getting interested in photography at Brooks Institute in Santa Barbara, but while I was there, I was intrigued by what the film (motion picture) students were doing in the studios nearby. I became very interested in cinematography and how lighting can help tell a story. So I changed to cinematography and transferred to Art Center due to its excellent reputation. But after about ten years of shooting commercials and music videos, I got a little burned out on the film industry. Then I happened to meet the San Francisco Ballet on tour in Greece and I had just bought a new Nikon D2H to play around with. I took a few shots of the dancers for fun. To make a long story short, the company saw the images and liked them. So I'm still shooting for the company four years later. JC: Your parents are both ballet dancers and your father, Helgi Tomasson, has been the artistic director of the San Francisco Ballet since 1985. Have you had any dance training? If so does this have an impact on how you visualize the images you intend to create? ET: I have never had any dance training, although I grew up around dance so I have a pretty good understanding of both its technical and creative aspects. When I first started shooting, I was told by the dancers that they could hear my shutter go off in what they considered the "right moments," so I guess something had sunk in over the years. JC: Is ballet the only form of dance you photograph? ET: Yes. I'm under contract with the San Francisco Ballet, which at this time means I can only photograph for the San Francisco Ballet. JC: Your ballet images are often action scenes. Do you shoot primarily in the studio, on the stage or the rehearsal hall? ET: I never shoot in a studio. All of my images are either on stage or in rehearsals. Which, in a way, is a little foreign to me since I mostly shot in studios up until I started shooting dance. JC: This leads me to ask about lighting. How do you prefer to light the dancers? ET: All the lighting in my photos is what is normally in the scene. I don't use any additional lighting, such as flash. However, that does not mean I don't think about lighting when I take a shot. In the rehearsal studios, I know where the good light is and what time of day I should shoot to get that light. On stage, I am aware of how everything is lit and where the dancers might look best. For instance, I tend to shy away from shots where there is a strong spot on the dancers. When shooting backstage, I'm constantly looking at how the light is hitting the dancers both on and off the stage and what shooting angles would be best. JC: What is the your primary choice of camera for ballet photography? ET: I use the Canon 1Ds Mark II. The 1Ds Mark II gives me what I need; full frame sensor, high resolution, low noise, and low light auto focusing that's extremely fast and accurate. But more importantly I prefer the Canon L lenses to most other brands. Specifically, I find the Canon telephotos are really remarkable. I use the 70-200 2.8 IS L and 300mm 2.8 IS L lenses most of the time when the dancers are on stage. In the rehearsal studios, I like to use primes as much as possible because of their speed. The 135mm 2.0 L and the 85mm 1.2 L are my first choices. JC: Do you use more than one type of camera? ET: No, just the 1Ds Mark II. I'm looking into the 1Ds Mark III at the moment but I haven't decided if I want to change yet. The Nikon D3 looks very interesting but I'm not sure if I want to start building two different lens and body packages in the same format. JC: What other equipment do you use; tripods, filters, etc? ET: I use a Gitzo 1326 tripod with a Gitzo three axis fluid head. I am toying around with a Lensbaby now. JC: When you are shooting a specific ballet, do you work closely with the choreographer if he/she is available? ET: I know most of the choreographers and I know their different styles quite well but I don't work directly with them. JC: Ballet has its own choreographic language. Do you use this to direct the dancers for a specific action you wish to shoot? ET: I have never directed a dancer to do a specific action. Everything I shoot is totally in the moment. I try to respect their work and stay out of the way as much as possible. I have never liked images of dancers when they are set up or even in a studio. To me, the emotion is lost when dancers are shot in a studio and posed and it just feels too contrived for me. Its kind of the same to me as if someone told David Beckham to pose shooting a goal in studio. He may be able to recreate how he would shoot a goal, but the energy of the game would be lost. It's the same with dancers. There is an energy there that I'm trying to capture that can only be caught when they are in their environment. JC: What do you feel is the most important thing to keep in mind when working with highly trained creative people, such as ballet dancers? ET: That's a tough one. There's so many things that I can think of that are important but I guess the most important is to respect the dancers while they are working. As I said, I make sure I don't distract the dancers when I'm shooting. If I need to move from one place to another, I move very quietly and usually during a moment that won't bother them. This in turn gives me more natural looking shots because, after a while, they forget that I'm there and this is what I'm after. JC: Erik, thanks for giving us some insights into the challenging world of dance photography and for sharing some of your exceptional and beautiful images. See more of Erik Tomasson's work. Jerry Currier is a contributor to PHOTOWORKSHOP.COM's Double Exposure. His photography may be viewed here.